I reviewed Kalamazoo downtown lunch spot Dogs With Style a couple years ago, but it’s recently come under new management, and the changes are significant enough to warrant another review. The ladies who run the place are taking it to the next level. 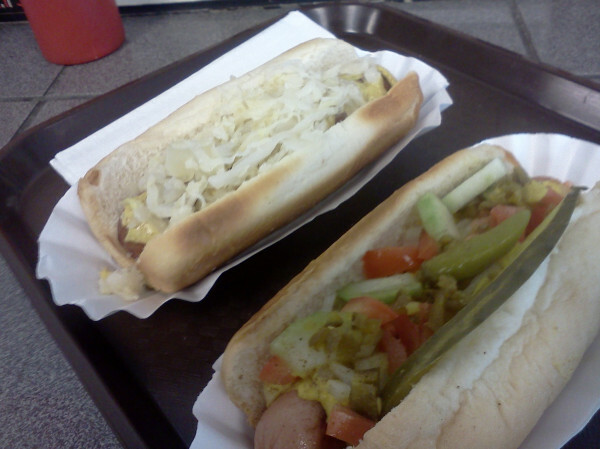 They still have the usual standbys, like Coney, Polish and Chicago dogs, and they’re all good. But the real draw of Dogs With Style 2.0 is the visionary new hot dogs they have. The one on the left is the Mad Max, and the one on the right is the Guatemalan. Say hello, boys. The two I’m reviewing, the Mad Max and the Guatemalan, are like edible works of art. 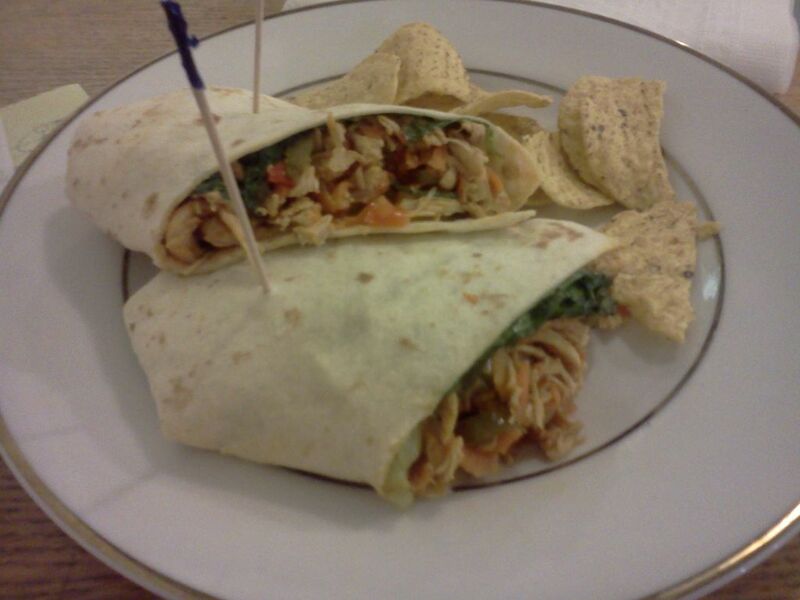 The Guatemalan is similar to a Chicago, in that it features a number of vegetables accompanying the frank. The Guatemalan includes cabbage, avocado, tomato, and a couple different salsas and sauces. There are a lot of flavors at work here, and they all harmonize wonderfully. It’s a bit spicy, but the avocado helps to cool it down. It’s a great example of the kinds of interesting things you can do with hot dogs if you have a solid imagination and palette. But on to the main event. The Mad Max is an evolution of the Swanky Franky, a fabled hot dog concept involving cheese and bacon my parents told me about as a child. I never imagined I’d see one in a restaurant in my lifetime. The Mad Max starts with a hot dog frank, split and filled with pepper jack cheese and then wrapped in bacon and cooked. It improves upon the Swanky Franky here though, by topping it with macaroni and cheese and sriracha and serving it on a pretzel bun. It’s a decadent delight. The central frank is delicious and well-crafted. I’ve never had a problem with cheese leakage or bacon falling off. The mac and cheese uses think bow-tie pasta and is dry enough that it works as a topping without making the whole thing soggy. You haven’t had the true Dogs With Style experience until you’ve had the Mad Max. 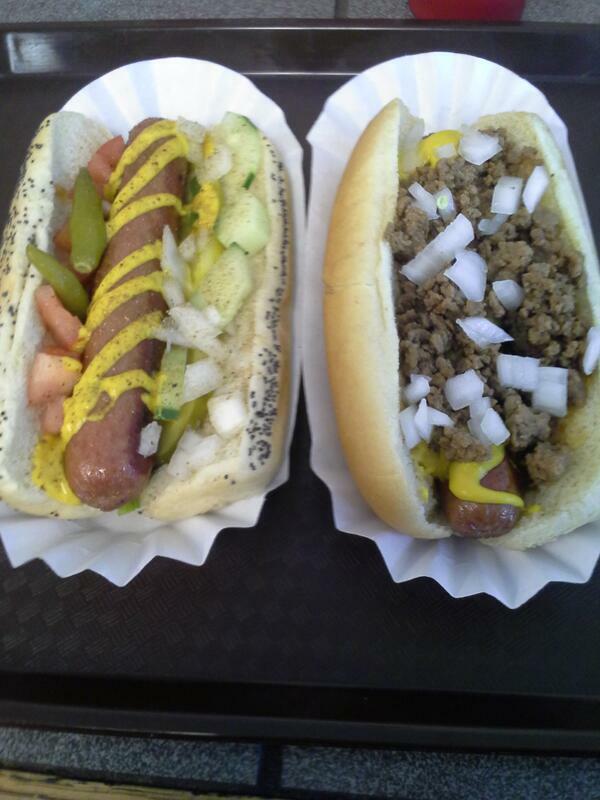 Just because I’ve waxed poetic about their specialty hot dogs doesn’t mean their regular fare isn’t great, as these Chicago and Coney dogs prove. The new Dogs With Style is even better than before, and definitely worth checking out. Most dogs range from between $2-4, well worth the trip. As far as I know, they’re still cash only at this point, so keep that in mind. They’ve also expanded the previous hours, so they’re not only open for lunch (11AM-3PM) but for late night snacks from 10PM-2AM Monday Wednesday and Friday nights. Growing up in Ann Arbor, I’ve walked past the Red Hawk Grill countless times. I actually get my hair cut around the block, so I’ve spent literal years walking past it. But it wasn’t until a recent recommendation by a friend that I decided to actually head in and give it a shot. And boy, am I ever glad I did. The Red Hawk Grill serves most bar & grill standards (burger, steaks, some seafood and pasta), but with a modern, inventive twist. A number of their offerings include Asian or Southwestern elements, and while I wouldn’t quite call it “fusion cuisine” (the atmosphere isn’t nearly austere enough for that moniker, for one thing), they have a number of clever, clearly carefully planned sandwiches and burgers. While I’d normally start with a basic hamburger of chicken club sandwich, the Peanut-Crusted Shrimp Burger caught my eye. A burger made of shrimp!! Could it be? I know it sounds crazy, but just go with me here for a minute. I wasn’t disappointed. My key concern, the amount and quality of the shrimp, was perfect. 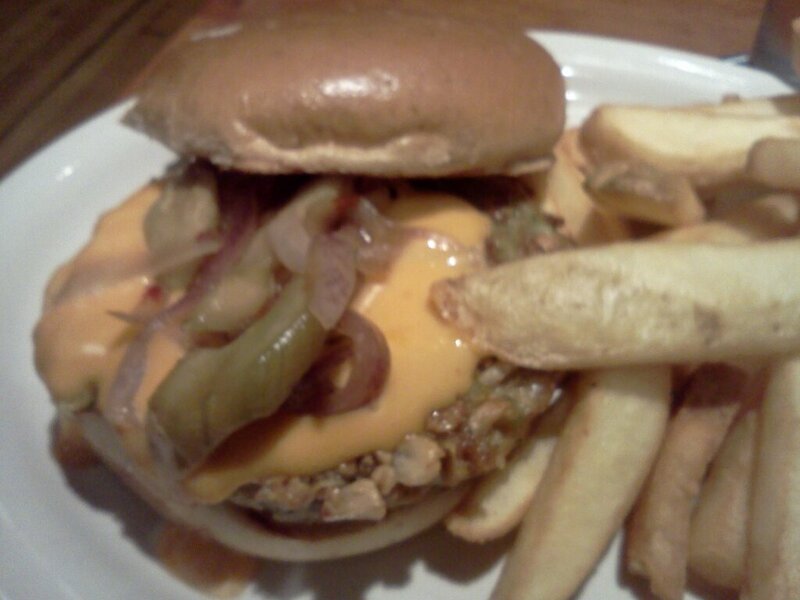 The core of the burger was a large patty made of shrimp meat, with a thin, subtle crust of chopped peanuts. The meat was high-quality, not scrapped together from cocktail shrimps as I had feared. It also had a nice, full texture, and was firm enough to hold together as I ate it. It came topped with a chile mayonnaise and a sweet and sour cucumber relish, which were tangy and flavorful, but still toned down enough for the shrimp to shine. I’ll need to head back soon to see how they do with actual ground beef and chicken breasts, but this burger pulled off something I previously would’ve called impossible. Burgers and sandwiches at Red Hawk generally go for $8-9, with an extra $2 for fries. This burger, at least, is a steal at that price. Next time you’re on State Street near Liberty, I’d definitely recommend checking it out. I can’t wait until I’m there again to try something else new, this was a first impression that did not disappoint. Taco Bob’s is exactly like Taco Bell, if Taco Bell was awesome instead of mediocre. 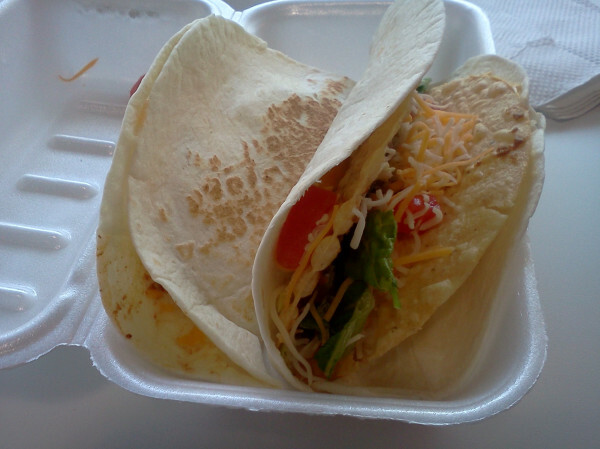 Like Taco Bell, Taco Bob’s offers a number of rather Americanized takes on tacos, burritos, enchiladas and the like. And like Taco Bell, the food is prepped while you wait, more like fast food than a sit-down restaurant. 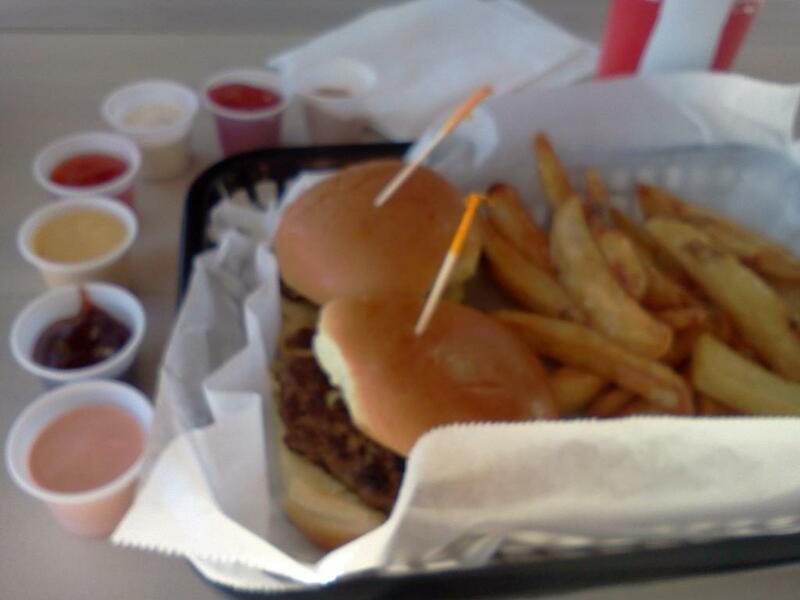 However, Taco Bob’s features fresh vegetables and higher quality meats than the average fast food fare. It’s prepared when you walk in, with an eye for customer service and satisfaction. And its locally owned, which is always a plus. My usuals are the Funny Taco and the Cheesy Taco, which are kind of analogous to the Cheesy Gordita Crunch and maybe a Cheesy Double Beef Burrito (but smaller) respectively. It’s weird, because there’s really not a whole lot to say about them, that I haven’t said. Just imagine Taco Bell, then imagine not having to hate yourself afterwards. Taco Bob’s runs slightly pricier than Taco Bell, since they don’t have a dollar menu. Combos run for about $6-8. Still, if you’re interested in some quick Mexican food, Taco Bob’s is more than worth the extra change. Taco Bob’s has a couple of locations in and around Kalamazoo, check them out!! The newspaper I write for, The Kalamazoo Gazette, was part of an ongoing project last week by reporters throughout the state to find the best Coney dog in Michigan. As a sandwich aficionado, I’m all for this. A lot of people don’t realize that Coney Island hot dogs originated in Michigan, rather than New York. Throwing chili, onions and mustard on a hot dog is one of the best things you can do with it (in my humble but correct opinion), and there are places throughout the state which do a great job. 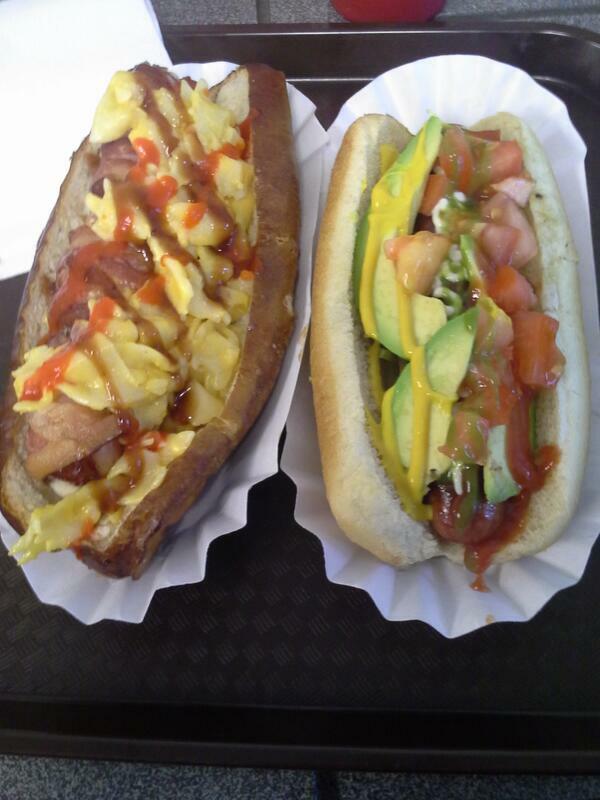 A Polish and Chicago dog from Dogs with Style. I've tried (and enjoyed) their Coney as well, I'll probably be posting a review soon. The full archive is available here. 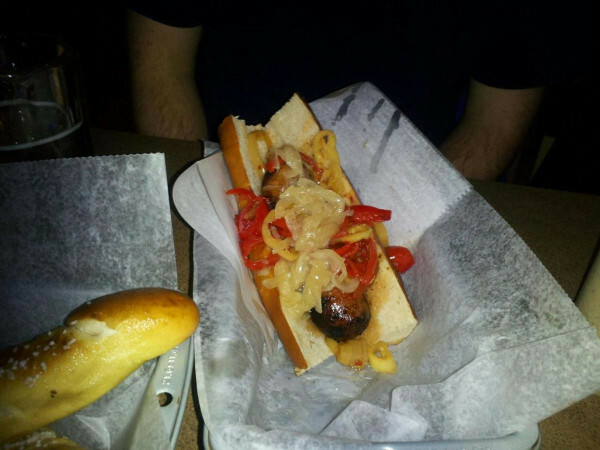 I’ve also included a link to my thoughts on some of the non-Coney offerings at Dogs with Style, one of the Kalamazoo spots the team visited.